Studies show that ear protection with integrated AM/FM radios can make you more productive and motivated while working. The Stanley Sync Digital AM/FM/Mp3 Radio Earmuff delivers strong hearing protection while allowing the wearer to enjoy crisp, high-fidelity digital radio reception. Digital AM/FM tuning with LCD display automatically searches for radio stations, while 10 pre-set stations and volume management technology allows for a custom listening experience. 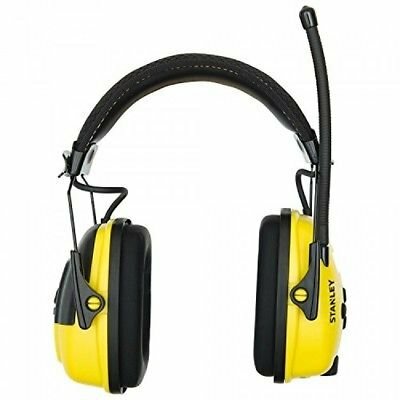 Suitable for most jobsites and work areas, this lightweight earmuff features patented Air Flow Control technology for optimal attenuation across all frequencies. Whether you’re working indoors or out, you’ll enjoy comfort and safety thanks to a slim earcup design, a padded headband with reinforced fork slides, and a maximum volume output of FM radio at 82 dB. Noise Reduction Rating of 25. 432320-001 HP 146GB 10K SAS SINGLE PORT DRIVE W/ TRAY 2.5"